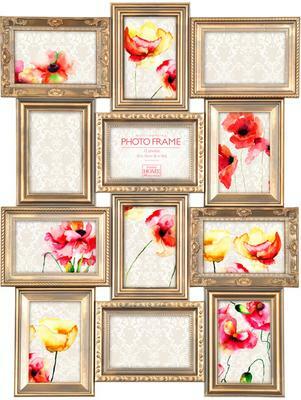 Displaying your memories in one place is easier with this beautiful Maggiore Gold Multi Photo Frame. Perfect for catching your viewer's eye, this gold frame exudes a lovely antique style finish that's ideal for traditional home. Each piece can hold up to 12 images in a 4x6 inch size. The frames are arranged in alternating portrait and landscape styles. 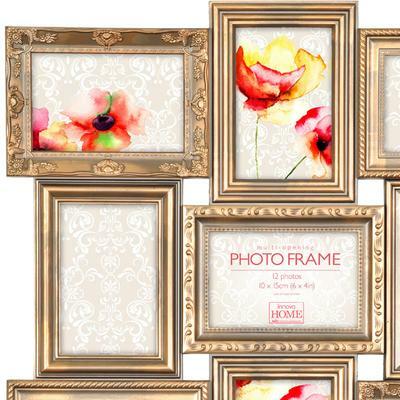 Each frame is also covered in a matte gold finish that easily complements coloured or black and white images. Use this to gather your favorite family photos, images of your pets, friends or even give this as a present on a special occasion. It's truly a wonderful piece.